Though I have to admit I’m curious as to how a rebooted Spawn comic might sell. § September 9th, 2016 § Filed under pal plugging, promo, retailing Comments Off on Though I have to admit I’m curious as to how a rebooted Spawn comic might sell. 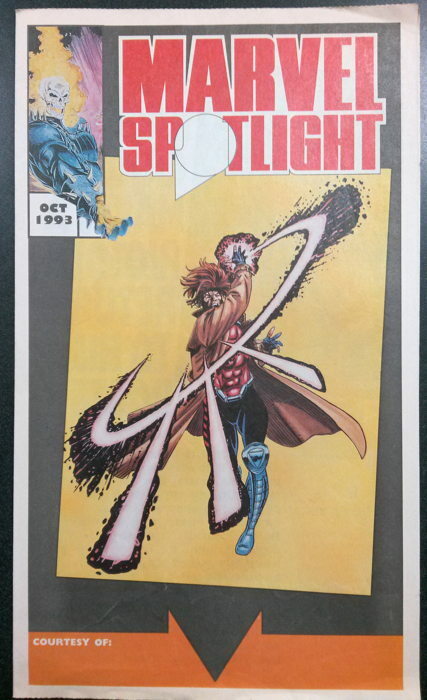 Now here’s a thing I’d totally forgotten about: the 8-page Marvel Spotlight giveaways from the mid-1990s. I mean, I completely forgot this was even a thing. I remember the various iterations of the regular DC promo flyers, the Eclipse Comics one…but no memory at all of this one from Marvel. It’s got the usual features: the individual issue spotlights, the brief interviews with creators, the full checklist of every comic due out that month. I know we must have had carried these at the shop, and I’m sure I shoved them into the shopping bags of customers, but…nope, these have completely departed what’s left of my mind. …And as usual with collections like these, there are a small handful of comics that are actually of use, and then there’s the pile that goes straight to the bargain boxes. Ah, well. 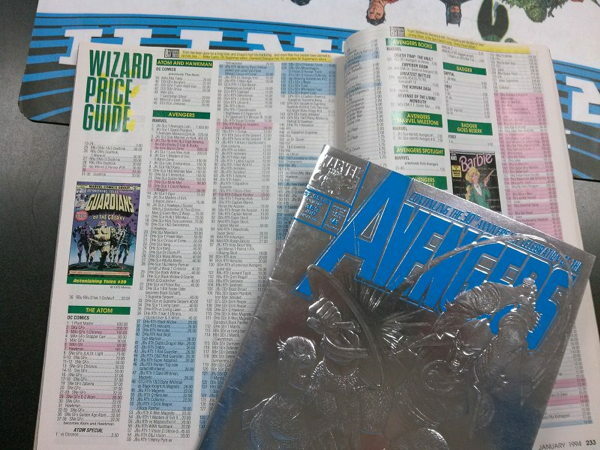 But it was neat seeing that old Marvel Spotlight …makes me wish for the days of regular individual company “coming attractions” freebies again, though those have been mostly supplanted by the Comic Shop News weekly paper and by Diamond Previews and oh, maybe the internet too, I guess. I mean, yeah, there are occasional high end free preview comics from Marvel and DC, but that’s not quite the same as a regular newsletter. The things one can get nostalgic for…. Well, despite my joke from that post, Spawn appears to be slowly crawling up in sales. Yes, it’s true that for the most part, this series sells pretty much at the same level, month after month, with the occasional fluctuation, and right now we seem to be in a slight upward trend. It seems unlikely that it’ll ever come close to its ’90s heights again, but what titles do? That it’s still selling at all is a success worth noting. Now Savage Dragon …it’s fine, more power to Larsen to keeping it going and staying true to his vision, but it’s bit of a hard sell around here, I’ve noticed. Well, at least on the rack…I have pull customers for it, but it’s not a title that people just sort of casually grab off the shelf anymore. Even at my previous place of employment it wasn’t a comic purchased by walk-ins…it mostly just went into hold boxes. Which is a shame, because it is a solid and weird superhero comic. Hopefully our area is just an oddball one, and that it sells just fine elsewhere. And you know what? Good on both McFarlane and Larsen for not relaunching/rebooting their respective series with new #1s! Hey, after a long hiatus, Dr. Polite Scott has resuscitated his site and once again doing comics medically-related funnybook blogging! Encourage that man to stick around a bit…go, read!